How customer focused is your company website? The more it is, the better your chance to get found online and connect with qualified prospects as North Coast Packaged Homes' owner Ann Zollinger has learned. The ultimate goal of most websites to get found online so you have the opportunity to convert visitors into leads. And, once that happens, you can then qualify them and even nurture them into eventually becoming customers. Simple, right? Well, as logical as that sounds, doing so takes discipline and intense customer focus. Kudos to my friends at BuildDirect! 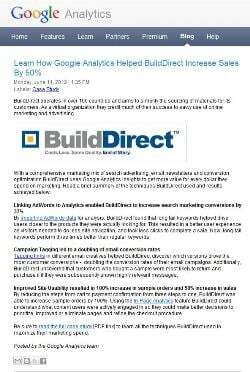 They are featured in a Google Analytics case study for using Google Analytics to get found online and increase sales!